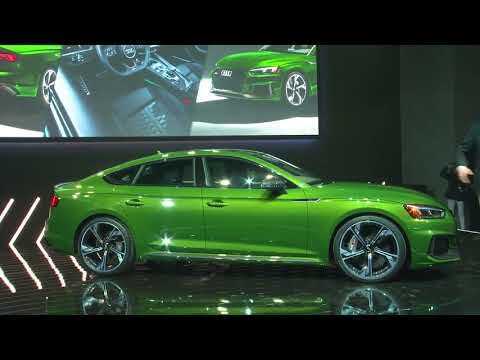 "Joining the performance family, Audi Sport launches its latest RS model - the Audi RS5 Sportback. Making its world debut at the 2018 New York International Auto Show, the RS5 Sportback offers a balance of high design and driving dynamics. The 2019 RS5 Sportback represents the latest model in the highly successful Audi Sport family, with breakthrough 5-door coupe design and exceptional performance. ""The Audi RS5 Sportback is a completely new offer for our customers. Our progressive interpretation of a five-door high-performance coupe has neither a predecessor model nor a direct competitor, ""says Michael-Julius Renz, managing director of Audi Sport GmbH, about the latest member of the RS family. ""The Sportback offers the ultimate in functionality with maximum performance."" The 2.9 liter TFSI V6 biturbo engine delivers power, efficiency and distinct RS sound. The new biturbo engine generates 444 hp and 443 lb-ft of torque available in a wide rev range from 1,900 to 5,000 rpm. The Audi RS5 Sportback sprints from 0 to 60 mph in under four seconds and achieves a top track speed of 155 mph, or increased to 174 mph with the optional Dynamic plus package. The two turbochargers on the 2.9-liter engine of RS5 are positioned directly inside the ""V"" promoting engine responsiveness and performance. For high engine efficiency, power and torque, the V6 engine uses a centrally mounted fuel injector and a combustion method with shorter compression and longer expansion phases. This B-cycle combustion process with central direct injectors further supports efficiency of the powertrain." "The 2019 RS5 Sportback represents the latest model in the highly successful Audi Sport family, with breakthrough 5-door coupe design and exceptional performance. ""The Audi RS5 Sportback is a completely new offer for our customers. Our progressive interpretation of a five-door high-performance coupe has neither a predecessor model nor a direct competitor, ""says Michael-Julius Renz, managing director of Audi Sport GmbH, about the latest member of the RS family. ""The Sportback offers the ultimate in functionality with maximum performance."" The 2.9 liter TFSI V6 biturbo engine delivers power, efficiency and distinct RS sound. The new biturbo engine generates 444 hp and 443 lb-ft of torque available in a wide rev range from 1,900 to 5,000 rpm. The Audi RS5 Sportback sprints from 0 to 60 mph in under four seconds and achieves a top track speed of 155 mph, or increased to 174 mph with the optional Dynamic plus package. The two turbochargers on the 2.9-liter engine of RS5 are positioned directly inside the ""V"" promoting engine responsiveness and performance. For high engine efficiency, power and torque, the V6 engine uses a centrally mounted fuel injector and a combustion method with shorter compression and longer expansion phases. This B-cycle combustion process with central direct injectors further supports efficiency of the powertrain." Each generation of the R8 brings to the road know-how acquired on the racetrack and from the legacy of Audi endurance racing. This year is no different. Updates to the 2020 R8 model line deliver a refreshed exterior design. The updated front bumper includes a new honeycomb grille with R8 badge, front spoiler lip, and lateral air intakes. The updated rear bumper continues with honeycomb air outlets, oval exhaust pipes, and a new rear diffuser. The headlights have also been darkened, and the rocker panel has been redesigned and includes an inlay. On the V10 model, the lower trim is finished in high-gloss black, and on the V10 performance model, the lower trim is finished in titanium color, with an option to select carbon fiber. The Audi Q8 brings together the best of both worlds – the elegance of a four-door luxury coupe and the practical talents of a SUV. The generously dimensioned interior with variable luggage compartment, state-of-the-art operating and suspension technologies as well as intelligent assist systems make it a composed companion for business and leisure. 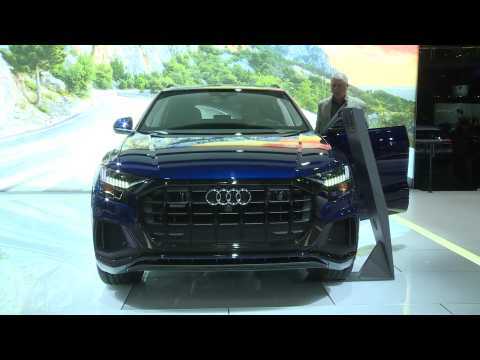 Now, the large SUV coupe appeals to an even broader range of customers thanks to two new engine versions.The new Audi Q8 55 TFSI is equipped with a six-cylinder spark-ignition engine with three liters of engine displacement and direct injection that produces 250 kW (340 metric hp). In the wide rpm range from 1,370 to 4,500 revolutions per minute, it develops a maximum torque of 500 Nm (368.8 lb-ft). Thanks to the turbocharged gasoline engine, the Audi Q8 sprints from 0 to 100 km/h (62.1 mph) in 5.9 seconds. Its maximum speed is electronically limited to 250 km/h (155.3 mph). The new Audi Q3 is a family SUV with great all-round talents. In the second generation, it appears not only visually more self-confident, but also roomier and more versatile. Just like the Audi top-of-the-line models, it features a digital operating and display concept, extensive infotainment solutions and innovative assist systems. These ensure additional comfort, as does the enhanced suspension. The new Audi Q3 will begin arriving at European dealerships at the end of the year.